In 2010, when Germany’s Bavaria Yacht GmBH called in the U.S.-based Farr Yacht Design, their goal was a yacht to replace Bavaria’s 36-foot boat. 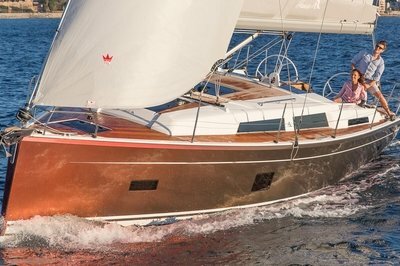 The Farr Yacht design became the Bavaria 37 Cruiser, with a near-cavernous interior, a wide range Danish Elvström sails and a fit and finish worthy of a winner of the 2015 European Yacht of the Year. The Bavaria 37 costs as less than a new Lamborghini, but it can take you and your family around the world. 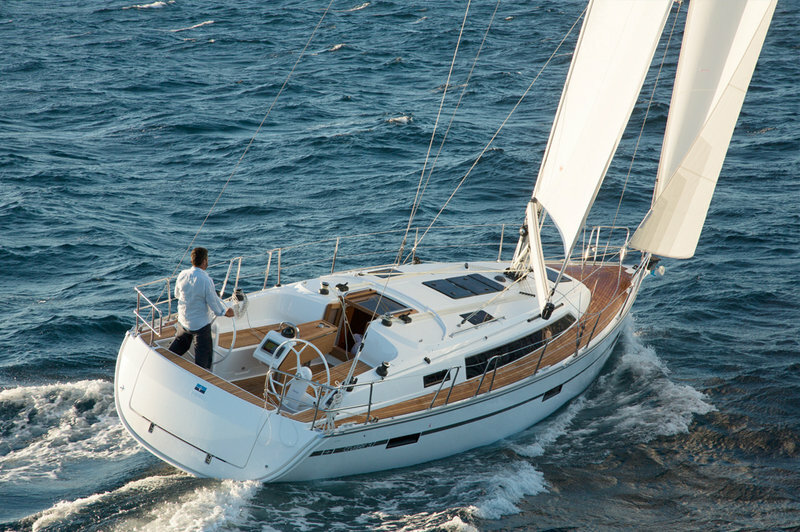 The Bavaria Cruiser 37’s ability to handle moderate seas is excellent. With a cast-iron keel, the V-shape bow flattens to a more rounded bottom at the stern, giving the boat a softer ride and decreasing its yawing motion when at anchor. Both of those characteristics reduce passenger discomfort. The hull and deck are of sandwich-type construction. Between the inner and outer layer, foam inserts provide additional flotation. Where deck fittings appear, the hull is reinforced by aluminum sheeting. Leather-covered wheels on twin steering pedestals control a symmetrical, balanced rudder and mean easy access to a wheel, no matter the degree of heel when under sail before a freshening breeze. The blocks for the forward sheets are track-mounted to let you use the Cruiser 37’s Genoa to best advantage. Seven hundred square feet of Elvström sails drive the Cruiser 37 and you have your choice of sail materials, ranging from basic Dacron to Elystrom’s high-performance EPEX laminated sail membranes. The master’s cabin is all the way forward, behind the salon’s forward bulkhead. The Cruiser 37’s sole head is across from the galley. Aft of the lounge, Bavaria gives a purchaser the option of having two aft cabins or three. 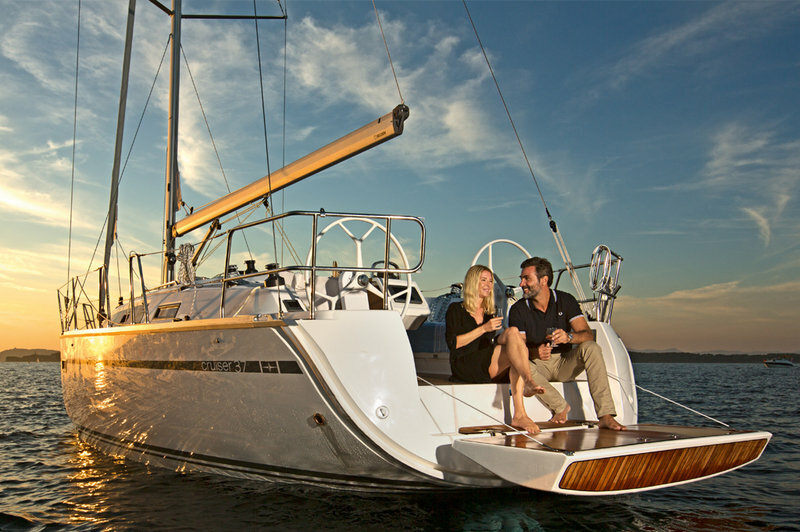 The Bavaria Cruiser 37, while not inexpensive, starts at less than $200,000 because of the demand. Boats this size can sail anywhere, from up and down a coast to around the world, and aren’t too big for small marinas. Bavaria expects to produce a number of them, based on the demand for the Bavaria 36, which sold 358 units worldwide, in part because it’s the most popular-size boat with charter fleets. Chartering makes sense for a boat that’s underused because its owners are too busy with life or family, but chartering also means the charterer must maximize the space available. 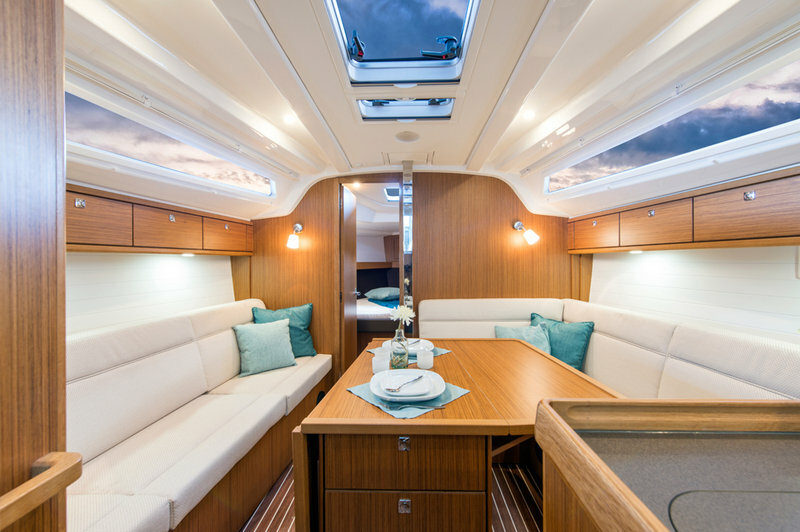 The two-cabin option means you have one queen-size berth, with a locker, over-bed lighting, an opening port and a hanging closet at the starboard, aft-end of the salon and a storage area of the same size – about that of a small garage – on the port side. This is the most attractive option if you do not plan to charter the boat out. 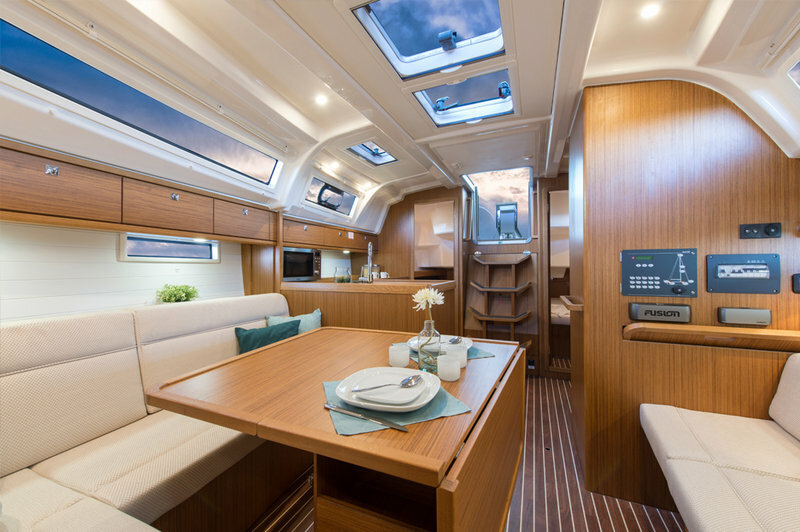 If however, you plan to let the boat out for charter, Bavaria’s three-cabin option gives you the ability to turn that space at the port side at the stern into a third cabin, with bed, locker, shelving and an opening port. The master’s cabin in the two-cabin version has two hanging closets and a navigation area, with VHF radio. On the three-cabin version, a smaller navigation area is found in the salon. Regardless of the number of cabins, the master’s cabin is spartan, with the exception of having twice as much storage. The master’s cabin’s cabin has over-bed lights, an escape hatch leading to the foredeck and a queen-size V-berth with shelving on both sides. • The Cruiser 37 is well-designed and well-built. • It’s as seaworthy as any vessel of its size. • It offers the opportunity to pay some of the expenses of ownership, should you choose the three-cabin option that’s suitable for charter. • It has only one head, although you can change the shower location in the two-cabin version. If you don’t plan to upgrade within a few years, go for the two-cabin option. A few years in three-cabin charter service will probably pay for the upkeep needed after it’s been in charter service and maybe some maintenance, but at the cost of the storage room. On the other hand, you’re also trading the ability to accommodate four for the ability to accommodate six.